I bet a lot of you throw out the stump at the end of the lettuce when you are done. Until recently, so did I! Then I discovered how to regrow romaine lettuce from the stump. Regrowing lettuce is so simple that anyone can do it. The number one reason why I do it is because it’s fun. I like to look at my lettuce all smug and think “other people would have thrown you out, but not me. Nope!”. But it is always handy to have extra lettuce in the house. 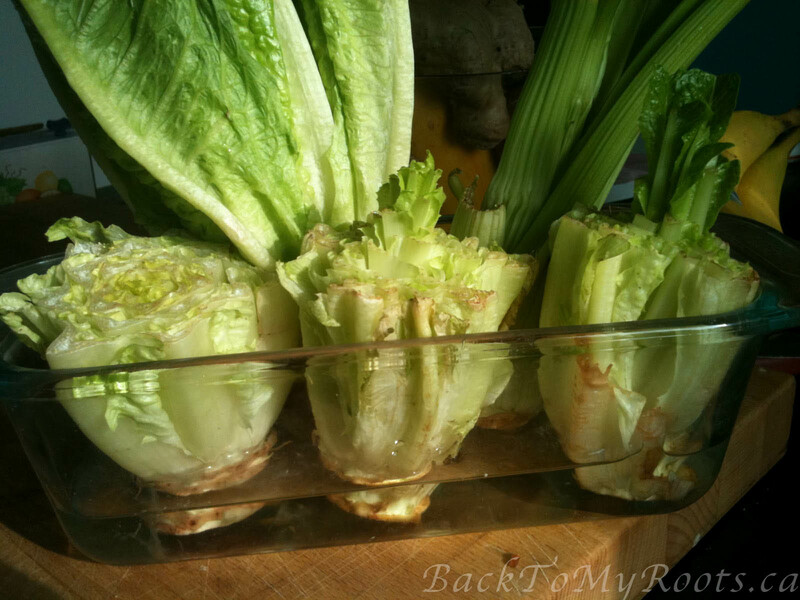 It is also cost effective to regrow your kitchen scraps instead of throwing them out. Buy a few heads of lettuce and keep them growing year-round taking only what you need for each meal. Okay, here we are at the point you really want to know! Save the end from your lettuce and put into a little water (about a half inch). Change out the water every day. It is very important to change out the water every day or your run the risk of the outer edges getting soggy. The lettuce will grow back incredibly quick.The one on the left I cut today. The middle one yesterday and the one on the right, two days before. You can see how much it grows in just three days!! I have had a lot of questions about the growing process. Unlike the green onions which I leave growing in water forever, lettuce does better when transplanted into soil after the roots have begun to develop. Romaine can be regrown in water only but I find the plant starts to suffer after a few weeks. The small leaves develop but it never reaches it’s full size. I use tap water. Just my plain old municipal water and they grow just fine. I know that my city does not fluoridate their water so I am not sure how that would play into the growing process. If you are worried about your water quality then a bottled water is best. The quality of water is bound to make a difference to the speed of growth of your lettuce. Well water tends to have more minerals intact and results in faster regrowth. So here is my dirty secret, I do not buy organic lettuce. I should. I know I should! I know some veggies that are not organic are treated so that they do not start to regrow or produce roots after harvest. This has not been a problem for me growing lettuce. If you find that you are unable to get your lettuce to root then try an organic batch next time. Green onions are ridiculously easy to regrow. I buy a small pack (of 4) about once per and keep them on my windowsill. They continue to grow at an alarming speed. The green onions growing in my window have been growing successfully for almost two years now! What other kitchen scraps do you regrow? Are there any other things you can buy form the grocery store and grow in your garden? I would love to know! If you live in the tropics you can grow the best tasting pineapples you ever had. Cut the top off the pineapple with about two inches of fruit with the leaves intact. Put it in a container with potting soil covering the fruit with leaves exposed. Don’t put in direct sun light and keep it moist, It should start rooting in a week or so and showing signs of new leaf growth. In a month or so you can transplant it in the ground in a sunny place.Sandy well draining soil is best. Or you can start it in a big pot and just move it to a sunny spot. Once it gets going do not over water it. Once or twice a week water the leaves. Be patient. It takes from a year to a year and a half to mature. This is evident when the bottom of your pineapple starts to get yellow/gold and the color slowly creeps up the fruit until the whole thing is yellow and it’s ready to eat right away. Once you’ve tasted a ripened on the plant pineapple you’ll not want a store bought. Actually the canned pineapple is more to what a plant ripened pineapple should taste like! I am regrowing my own Romine Lettuce and celery right now in my kitchen just in water. How long does it take to see results when you first do it? I put mine in last night :). Not that I expect results this soon. I used to grow leaf lettuce (like buttercrunch). It really depends upon the your tap water. I have plants that have been growing in our water here in NJ for years! Great idea! I have yet to try leeks!! Do you keep them in the fridge or can they be left out on the counter? OR do they have to be put by a window for sunlight? This is so neat! Just curious: Where are the nutrients coming from in this method? In traditional growth, the nutrients come from the soil. Any idea if these have any nutritional value? To be honest, I am not sure. I know they are able to make their own food from the sun and water but i imagine that without any minerals from the soil that they would be lacking full nutrition. I ended up moving mine to a pot with some soil a few months into the project. They grew great either way! The main nutrient for plants (carbon) comes from the air. Different types of lettuce have much different levels of nutritional value. The least nutritious is iceberg lettuce. What makes iceberg lettuce good for you is the fact that it has so few calories that any vitamin, mineral or antioxidant found in iceberg lettuce is considered a freebie. Much better choices include bibb, romaine, and red lettuce. Red lettuce has the most antioxidants. I’m not looking at a lettuce chart right now, but I think that bibb has more iron, and romaine has more vitamins. I would like to know the nutrition content of lettuce that is grown in water alone as opposed to lettuce grown in soil. Thank you for your response! I didn’t realize that about red lettuce! I will have to grow some in my garden this summer! I placed mine in the window four days ago and they are growing great, I don’t have a lot of sun in my kitchen window because I have a sun room behind it, where my six cats are so I can’t put them there. The plants are growing just fine, I am going to add other veggies to see them grow, I think this is a great way to save money. Any ideas of other veggies we can grow?? No one is hopelessly stupid. And calling someone that is unhelpful. If you have information to share, be helpful and share it. Otherwise, don’t say anything. The nutritional value will be lower, but the most noticeable difference will be flavor. A good portion of nutrients for the plant come from soil, though the plant itself “grows” nutrients. However, the flavor is affected by what is put into it. If you put just water in, it will taste close to water. Also, without proper nutrients, you probably won’t get something like this to grow more than a few times. They need sun, air and water to make their own food. Is this where nutrition might come from? Hydroponic gardening does not use soil, though I think in commercial set ups they provide nutrients in the water. Interesting thoughts…. Maybe a scientist can help us out! hydroponics often uses fish waste to fertilize the water.. I have a 20 gallon fish tank, and my Wife uses the water for all her houseplants. She hasn’t used fertilizer in years. Such a great idea. I have a fish tank too. My cats love to drink the water and actually learned how to open the lid (very noisily) by themselves. A little old, but I just started doing this recently in an aquaponic tank. My five romaine heart stems are going strong. I have only a single betta in my tank and it’s a fun experiment. I did also cut a very fine sliver off of the end of some of them and those seem to be rooting faster. I’m going to let it grow a while in the aquaponic tank and see if they wilt at all. I have tried doing celery before and then planting it outside (which didn’t work out that well). How long until you are harvesting the new growth? Celery is really hard to grow no matter what technique you use. I tried planting celery stumps 4-6 inches high, they eventually just rotted. I put mine in a hanging flower pot, minus the hanger. I did this after it started growing. It did grow into a full stock just like I had bought in the store to begin with. Celery requires a lot of water. I use to flood mine almost daily when my pot was sitting outside. I discovered this when going out to my compost pile and finding my green onion ends had grown into new green onions. I planted old green onions and they grew. Lemon grass will also “sprout” when the root is put in water. Ours has been going since September. How many times can you replant the same stump of lettuce? I have my first one in a pot of soil and it is amazing how much it is growing. Do you leave the stump in the soil and slice off the top or remove the entire plant? I know I’m late but maybe someone else will be helped! You should leave it planted, but if you want it to recover quickly you shouldn’t chop off all of the leaves at once. It needs them to grab sunlight. Your best bet to have healthy plants is to keep multiples and take a few leaves from each one. But then, some of these leafy veggies, the sprouts don’t taste the same when they’ve been left to grow for a while, that’s worth noting. (I’m not sure which, as I don’t grow them). As far as replacing the soil is concerned, I’d much sooner recommend giving your soil a natural, non-chemical food source, but an organic fertilizer would be good too, every once in a while. The easiest good option would be to plant in a great organic soil blend, such as Fox Farms Ocean Forest, which would feed leafy vegetables for several months and allow them to grow very strong, fast, and healthy! Miracle Gro’s organic stuff isn’t too bad, but I really don’t recommend the non-organic potting or garden soil. celery, beets, lettuce, potatoes(organic because non organic is sprayed with a non-growing agent), onions, pretty much any root vegetable. If you have the room in your yard you can also save the seeds from vegetables, dry them and then start them early in the spring and plant them outside for the summer- i did this with cantelope last year. and as for how many times you can replant the same stump of lettuce- you should be able to keep it and not have to regrow it. Keep it short and trimmed and you will continuously get fresh leaves. If you leave it and let it grow tall the leaves get bitter but are still edible. Great suggestions! I have been meaning to try avocados and pineapple. I am not sure either of them will fruit well here in Canada but I enjoy a challenge! Good to know! Thank you for sharing! I have 4 cats! It’s like a soup kitchen for kittens at my house! The avacado grows in a tree not a plant. Take the seed out of the middle of the fruit. Stick tooth picks on each side of the pit. place the pit in a glass of water so that half of pit is submerged. It will start to grow in a bout a week. you can leave it ;like this for several months in the water until you are ready for planting. It takes about 5 years for it to become a full fruit bearing tree. And when the tree gets to growing good watch out it becomes massive!!!!! I have been growing pineapples for years here in VA. The mother plant will die once the fruit has been picked, but there is always a baby shoot that comes from the original plant. I have been growing them for about 9 years now and have eaten about 15 fresh pineapples. All of this from one top from a local grocery store. You’ll never want a store bought pineapple again after eating one of the fresh grown ones. You must be patient though; it takes about 2 years from shoot to fruit. Do grow the pineapple inside or outside? Pineapples need a lot of sun. I can’t imagine one getting enough light inside. Leah, I thought avocados grew on trees. How do you regrow them??? You can grow them from the seed inside! There is some debate about whether or not it will fruit though. But either way you get a cute tree! It will fruit eventually, but the tree grows to around 30ft tall and it doesn’t fruit until it’s fully grown, so you have to have space to grow and unlimited patience! i read somewhere that it takes at least 4 years before an avo tree can fruit. and pollination is tricky cuz they are sorta self pollinating. meaning one day the flowers are male and the next male. so dusting the flowers with the same “duster” on both days is essential. I’ve grown green onions for years now. I never add them to soil, just swap out for clean water. I just put 4 Romaine ends in some water yesterday. There is already a little bit of green growth. Anyone have any suggestions on how long i should keep them in the water before i move them to soil. And how big of a pot? I really wanted to keep them on the window sill, if at all possible. I bet a few drops of minerals (supplemental from health food store) in the water would load the veggies up and make them more nutrient dense. why couldn’t you use some liquid fish emulsion? I boil potatoes & give the water to the plants. Loaded with magnesium. I boil eggs the next week to use in food dishes and also feed my plants with the water. Lots of Calcium. My plants take off growing faster than usual. I have a huge garden summer and winter. I tried that, but after the green shoots were about 3″, they died off and I planted 4 sprouted garlic sections. I start my garlic in Oct here in TN. Plant each clove about 12 inches apart and 2″ deep. They grow fast but aren’t really ready for about 9 mos.. The plants will grow “scapes” (curly shoots with buds at the ends) these are delicious chopped up for salads or sauteed in butter or olive oil and added to pasta dishes. I realize that I am VERY late to this conversation, and I hope nobody minds my little contribution to the conversation. I tried growing garlic a couple years ago. Waited about 8-9 months, the scapes were beautiful and green and lush, but when I checked for the garlic bulbs (which I was POSITIVE must be plump and lovely due to how gorgeous the scapes were) there was NOTHING! I don’t know what I did wrong, and the waiting and hoping and expectations contributed to me crying a wee bit. I did everything the way it’s supposed to be done, (as far as I know, I spent a lot of time reading about how to do it and applying what seemed to me solid techniques) but nothing! I didn’t know about the benefits of scapes alone and their many uses at the time. Wish I had, but now that you’ve all been so very helpful, I’m definitely going to keep trying; Jeannie D’s information about how to use them has most certainly piqued my interest and curiousity…and my tastebuds! There are minerals in water. You can also start Thai basil from restaurants. just put a piece with a couple leaves in some water. It will root along the stem and then you can plant it in dirt. I knew green onions would regrow in water and I’m happy to know about these other veggies. Btw, add water to your empty milk jug and swish it around then feed your plants with the milky water. It’s a balanced plant food and it’s free. I’ve been feeding my plants with it for years. ty all for all the great tips,,i am going to try these methods , what a great concept.. Does it take two pineapple plants to get fruit on one? I’ve had my pineapple that I started 4 years ago from the tops cut off a store pineapple. It is now in a large pot and is 4′ or more tall. All I have is the green spikes that have taken over my dining room. I live in the Northern climate area, Central WA, so can’t transplant it outside. You don’t need two pineapples to get fruit. Try placing a small apple in the top most crown of leaves, cover the top and apple with a plastic bag, close the bottom with a string. The apple will release a gas that will stimulate the crown to form fruit. humic acid by my company Ansazi Gold Organics is an 100% natural minreal supplement which could easily enhance these techniques/ anasazigoldorganics.com; it really does work…. Also go to Pinterest, look up gardening, pin the ideas you love and always have them. They have homemade recipes for plant growth and also an awesome one for killing mosquitos. Great ideas for those lettuce containers you buy and using them as little greenhouses to get your seeds started. I cut a sweet potato in half, stuck 4 toothpick halfs in each of the bottoms to raise it up off the container bottom and added water. After a month or so I was able to divide the glorious vines and plant them in soil. Now come spring I won’t have to purchase sweet potato vines for my containers! this is great! Yes this does work, however that much after 3 days is a bit dramatized. I have been doing this for a while now, and you see growth just starting around 4 days. Also the browning takes a while to happen. Not like in the photos. But thanks for the good tip, Just be a bit more realistic in growing times. How do you know she didn’t just get lucky, or have really good water? Better yet, if that water has added minerals it takes a shorter time. I live in an apartment in Florida, and I am trying to re-grow lettuce. Its been 4 days and I really haven’t seen any growth. Do you think this could be due to the water? My first try didn’t seem to be taking either (for about a week). I found that by cutting a small slice across the bottom of it (just used a steak knife and slid it across making maybe 1/8 inch deep cut) the lettuce started sprouting in the next couple of days. I used this same method with the next two attempts and they started sprouting new leaves in just a couple of days. I saw this link/idea on Pinterest and just started my romaine about 3 days ago and I saw progress the very next day! I swear it grows so fast that between the morning and night there is a definite difference. We have well water, not sure if that makes a difference. I am really hoping that I can transplant this to a pot or my raised veggie bed outside and it will keep going. Question: should you ever peel away the outside non-growing layers? Thanks! Is romaine lettuce safe to eat if you don’t change the water everyday? I just tried this and had several new leaves growing in 2 days! Amazing! I made an ‘x’ in the bottom. I’m wondering when I can plant it outside, and if I plant it as is, or if I remove some of the orginal out leaves. My brother recommended I may like this blog. He was once totally right. This submit actually made my day. You can not consider just how a lot time I had spent for this info! Thank you! Generally I don’t learn post on blogs, however I wish to say that this write-up very pressured me to try and do it! Your writing taste has been amazed me. Thank you, very great article. Hi there, I found your website via Google while searching for a similar matter, your site got here up, it seems to be good. I’ve added to my favourites|added to bookmarks. Fantastic items from you, man. I’ve have in mind your stuff previous to and you are simply too wonderful. I actually like what you’ve got here, certainly like what you are stating and the way in which through which you assert it. You’re making it entertaining and you continue to care for to stay it wise. I can not wait to read far more from you. This is actually a terrific web site. Hi there, You’ve performed a great job. I’ll certainly digg it and personally recommend to my friends. I’m confident they’ll be benefited from this site. Just wondering if you transferred it or kept it growing in the water…my lettuce looks like it’s ready to bolt! If you remove all the leaves totally from the romaine you are left w a core (stem). Place it in a saucer of water. When it has some healthy short leaves place it in a pot of dirt. It will root & eventually go to seed, so you can get seed from a grocery romaine for free. Celery is much easier, will actually root in the water & when you transfer to dirt grows great celery for a season, then seeds. Pretty foliage, good as ornamental surrounded by flowers. The root end of the onion that you cut off: Place in saucer of water on windowsill & it will grow roots & a green onion. Plant outdoors. All of these that are started inside must be on a windowsill for the light. Carrot: Place the top you cut off in saucer of water & after it sprouts grren ferny top, plant it. You get a new carrot, unless you let it gio to seed. Look up on internet how to start sweet potatoes from the ornamental vine that you grow. You get many from one sprouted & vining sweet pot. No variety of lettuce will actually root to give you seeds in just water, needs dirt. Happy gardening. Ah, garlic: each clove sprouts, but refrigerate the garlic for a month first. Hey there Fast inquiry that’s thoroughly from subject matter. Have you figured out how to make an internet site smartphone welcoming? My web page appearances creepy when exploring from my phone. I’m trying to find a subject or plugin that might be able to resolve this challenge. If you have any suggestions, please share. My friend said she tried this, and the leaves were bitter “because it thought it was going to seed”. But, wouldn’t it have thought to seed the first go around when I bought it at the store? Maybe she ate it too early? I also didn’t have any luck trying to grow avocado from a seed. But then again I doubt it could handle the climate here in Canada. Did anyone have any success? I did, also in Canada. It took 8 yrs for it to product fruit. Avocados take patience. A lot of it. Thank you for this interesting tip. My family spend a small fortune on buying lettuce because we all seem to eat so much of it, like rabbits, but so little of the lettuce feels useable. I’ll definitely pass this tip on to my mother to try and see. I wonder if my brother and dad will be able to tell the difference? Only one way to find out I suppose. Did you know you’re featured on ABC15 for regrowing romaine lettuce? Where you said that lettuce doesn’t have a lot of nutrition, I believe you’re thinking of iceberg lettuce. Romaine lettuce however is a different story. Check out its nutrition profile on NutritionData.self and at WHFoods.com Links below, or copy/paste. Such a helpful video, they come out looking amazing! Is there a site that I can visit where I can find problems with regrowing lettuce this way? My lettuce is coming up with dark brown (rotting?) leave from the centre of the new growth a few weeks after cutting and placing in water. What am I doing wrong? My best guess is that water is getting to the inside leaves. Its important to only get the water on the outside when you water it. Standing water on the inner leaves will cause rot. Lettuce leaves are sensitive to moisture!